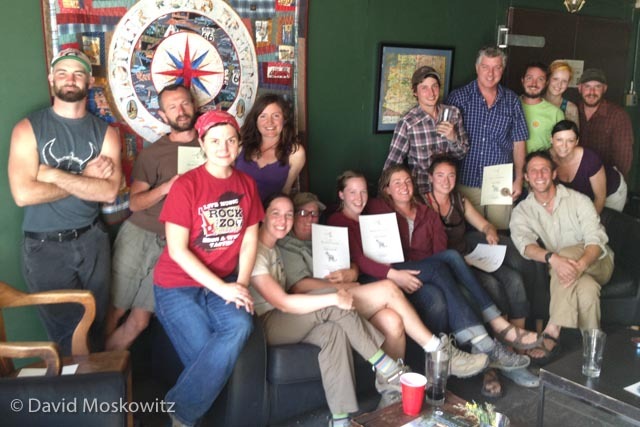 In early May I had the opportunity to travel to northern Arizona to deliver a Trailing workshop and a Track and Sign Certification around Flagstaff and Sedona for a group of local naturalists, hosted by Earth Encounters LLC. While I was in Arizona, I also gave a slideshow on Wolves in the Pacific Northwest hosted by the Grand Canyon Wolf Recovery Project. During the two day trailing workshop, participants practiced various component skills which are required to effectively and efficiently follow the trail of an animal over challenging terrain. These include detecting tracks in grass, leaf litter and other challenging substrates, anticipating how an animal will likely move across the landscape, and stealth in movement so as not to alert the animal being trailed to your presence. After a morning of exercises we spent the afternoon trailing a group of mule deer for several hours, finally getting to observe them foraging as an afternoon thunderstorm rolled in. On the second day we spent the day trailing a small herd of elk through a forested landscape. 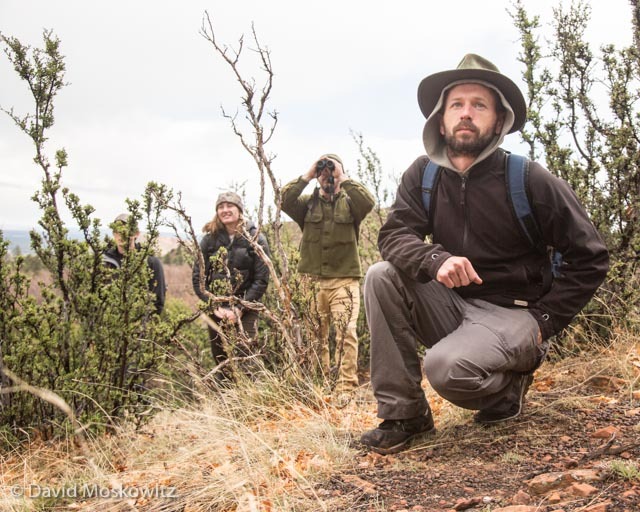 Rayne Zhaughsome on the trail of a herd of elk during a trailing workshop held north of Flagstaff Arizona. Day 1 of the Track and Sign certification took place outside of Sedona, in a desert landcape and along the riparian corridor of a stream. Species whose tracks we encountered included kit fox, bobcat, kangaroo rat, striped skunk, black bear, river otter, beaver, coyote, cottontail rabbit, and lizard among many others. 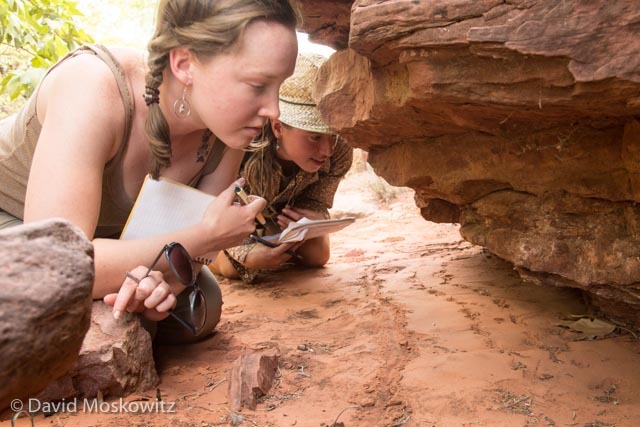 Jill Cooper and Rebecca Fitzpatrick inspect the trail of a turtle under a rock overhang. These tracks of a kit fox in dust where one of the first questions during the evaluation. Their small size, very slender shape of the hind foot and diminutive size of the metatarsal pads differentiate these tracks from those of a grey fox. 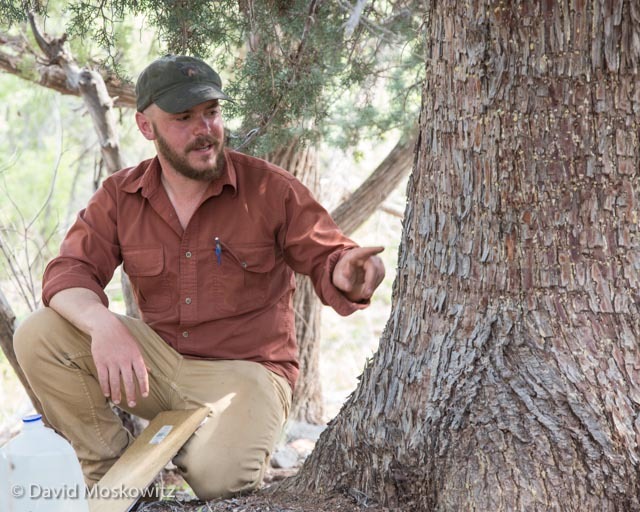 Local expert Matt Monjello, seen here discussing sapsucker feeding sign left on a juniper tree, organized and assisted with the evaluation. On the second day of the evaluation we spent the day in a forested area outside of Flagstaff where we encountered a wide variety of signs of wildlife including acorn woodpeckers, elk, deer, bobcat, coyote, deer mice, and jackrabbits. 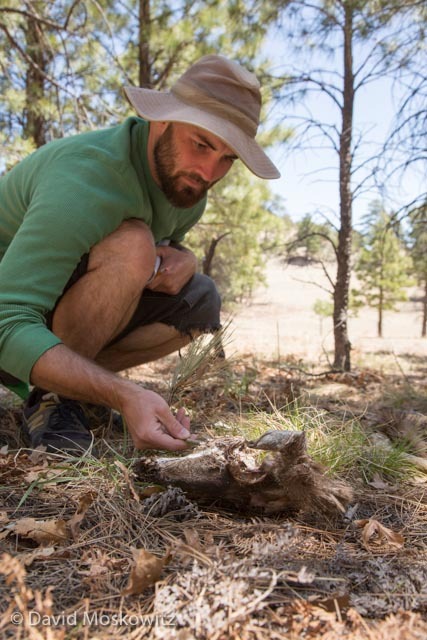 Rayne inspects the remains of a mule deer during the evaluation. 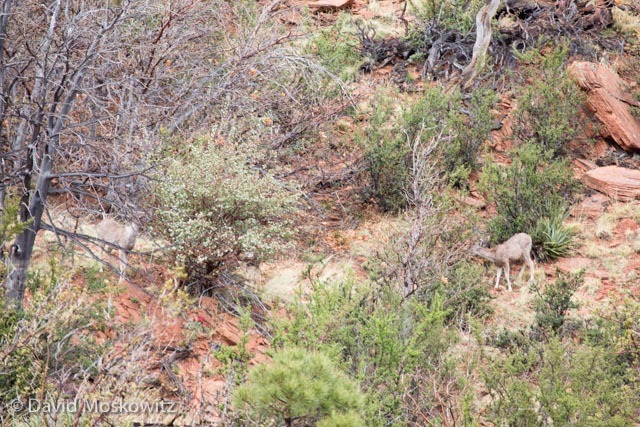 It can be hard or impossible to definitively say how an animal such as this one died but several clues indicated that this deer may have been consumed by a mountain lion and scavenged by coyotes. For a complete list of certified trackers in North America visit trackercertification.com.